Good morning ... The Senate is working a short week this week, but that still leaves plenty of time for everyone to get worked up over the repeal bill from Sens. Lindsey Graham and Bill Cassidy. What is dead may never die. My Axios colleague Caitlin Owens and I are both deeply — like, Mariana Trench deeply — skeptical that the latest Affordable Care Act repeal bill can pass. 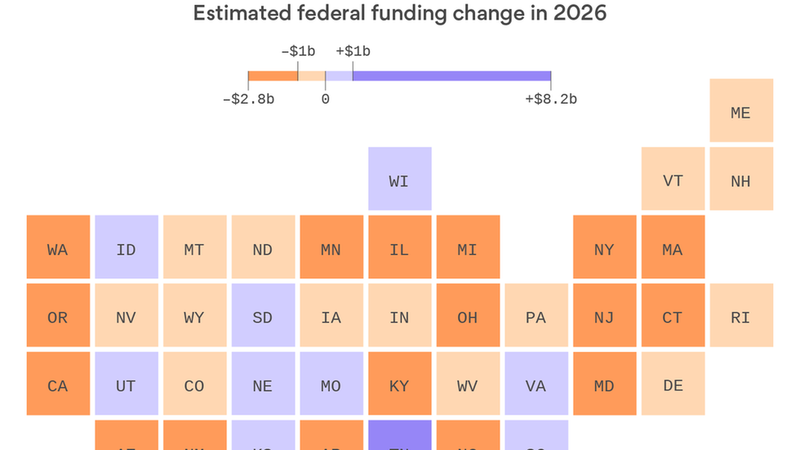 One of our many reasons: A lot of Republican senators' states — particularly those that expanded Medicaid — would lose a lot of money. Alaska is among the losers here, and it's hard to see Sen. Lisa Murkowski getting on board with this bill or this process. Same goes for Sen. Susan Collins. Sen. Rand Paul has said he's a "no". Sen. John McCain was a "no" last time, largely on process grounds. The process hasn't changed. And this bill would hurt his state. Two of those "no" votes would have to flip to "yes" — by the end of the month — for this bill to pass. And that's just the Senate. Changes to the process by which states can obtain "innovation waivers"
Bailouts inject new money into some system or institution, but that's not what would be happening here. A commitment to fund the ACA's cost-sharing subsidies would not require any new spending. These subsidies are being paid today, and have been since 2014. The Congressional Budget Office has already said this proposal would maintain the status quo, and therefore would not create any new costs to the government. Reality check: The $0 price tag is a big part of the reason this idea is on the table in the first place. HELP Chairman Lamar Alexander is working hard to keep this deal as narrow as possible. And this is something Congress can do, without spending any new money, to help bring some stability to the states. Since Sen. Bernie Sanders introduced his bill last week, I've gotten a lot of questions about the meat of single-payer systems — how they work, what counts as "single-payer," where Sanders' bill falls on that spectrum. Sanders' bill is considerably more generous than Canada's system. Canada's government-run system doesn't cover vision, dental, home health care, or prescription drugs. Two-thirds of Canadians buy private plans to fill in those gaps. Be smart: A lot of Democrats backed his bill as a jumping-off point from which they'll release their own proposals. A lot of them will be less ambitious than Sanders'. But if and when that becomes grist for Democrats' eternal infighting, just remember: Even the actual single-payer systems Sanders wants to emulate are less ambitious than Sanders' plan. Last week, my Axios colleague Bob Herman wrote about how Medicare is uncritically approving nearly every payment recommendation from the American Medical Association's panel of doctors, known as the RUC. Peter Smith, a heart surgeon at Duke University who chairs the RUC, submitted a statement to Bob through the AMA. "The RUC does not control the Medicare payment system, nor does it set rates for medical service. The regulatory process affords hospitals, home health agencies, nursing homes, private health insurers and others the same opportunity that the RUC has to provide input into the policies that determine Medicare payment rates. Yet only physicians are singled out for criticism when making recommendations in a manner so organized, thorough and accurate that those recommendations often are accepted." Bob's reality check: The RUC may not technically set rates for medical services, but effectively it does when Medicare is prepared to accept 99% of its suggestions and makes it clear it will rely even more on the RUC in the future. The White House is trying to gin up support for Graham-Cassidy, according to Politico. McCain, speaking on Face the Nation, seemed to reiterate his support for regular order and praise Alexander and Murray's stabilization effort. The Food and Drug Administration is eyeing a new policy on compounded drugs, Reuters reports. The New York Times reports that insurers have been restricting access to more expensive alternatives to opioids. And The New Yorker walked through research that says the opioid crisis could be costing the U.S. economy nearly $80 billion. What we're watching this week: The Graham-Cassidy show. Tuesday: The Kaiser Family Foundation releases its annual survey of employer-based health care.